Voice your opinion! Review Fast Net Webdesign now. I've had nightmares that weren't as scary as dealing with this company and their support staff. Stay away if you can. Is Fast Net Webdesign your company? 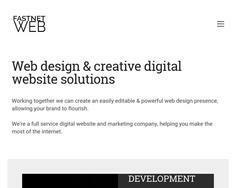 Web design and creative digital website solutions in Sussex & London. Creating a powerful digital presence, allowing your brand to flourish.